Yesterday marks my final photo from the St Paul Winter Carnival. I am however, still posting a photo from the St Paul area. 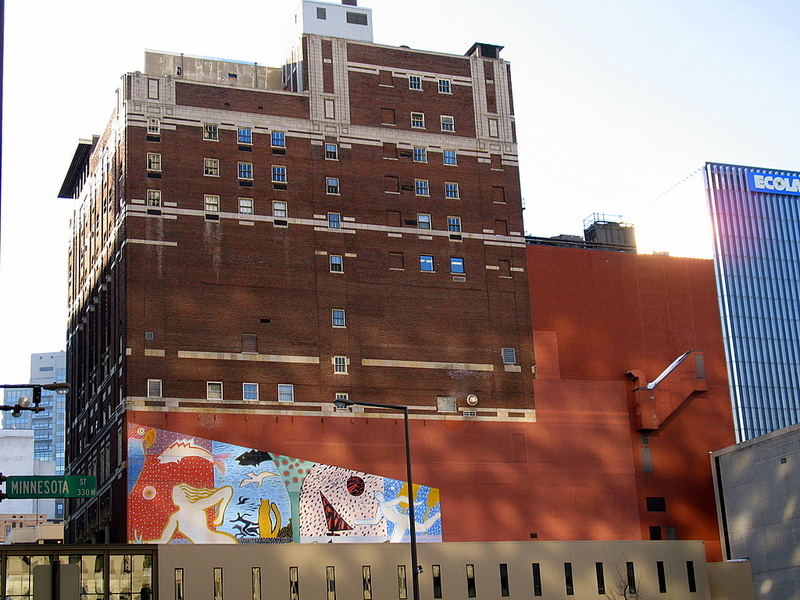 The build your see with the mural on the side is the St Paul Athletic Club building. It was finished being built in 1917, it has 14 floors and is mainly residential from what I've been reading. Though this is a distance photo and I can't really tell for sure, but it appears that some of the windows on the top floors are broken. It could be reflection shadows, but if they are broken, this photo was taken in the winter and I couldn't imagine those floors are in use. Excluding the mural, do you see the smiling face somewhere in the photo? Neat picture, but I dont see no stinking smiling face. The smile, I think, is in the windows of the building behind to the left. Nice photo. It is the building, just above the Minnesota St sign and the street light. When ever I see that building, it always reminds me to smile. Ohhh, Slinger! I see it! But you're always smiling anyway. I can't imagine you not smiling. Great photo of a massive building! UGH, I would have never seen it.